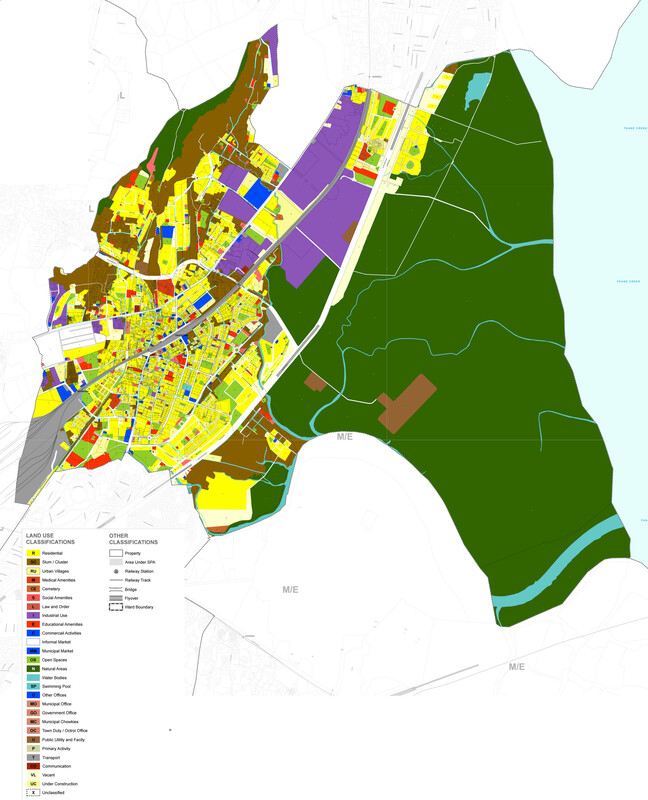 The Development Plan (DP) of Mumbai is a statutory document that lays out important parameters of growth in the city, such as land use and Development Control Regulations (DCR). This plan is comprehensively reviewed once in 20 years; currently, the DP 2014-34 is under review, scheduled to come into effect over the next year. In this day and age of technology access, this plan is very different from all other plans. The municipal corporation and the team of consultants hired have taken great efforts to make data available and visible to people. It is common knowledge that a lot of data used in the map is secondary data available in the public domain, however, what the DP does for the first time, is it links the data to the land use plan using Geographic Information Systems (GIS), geo-coding quantitative data to a physical map. Based on these analyses a comprehensive set of preparatory studies were produced to make visible how and what the corporation reads of the city. (Click here for the document). In Mumbai, 42% of the population lives in informal settlements, and a large proportion of the population are employed by the informal sector; studies have indicated more than 200,000 hawkers in the city. [i] These are realities that cannot be evaded. In a meeting discussing the relevance of the Mumbai Metropolitan Region Concept plan it was stated that out of 27 lakh families in Mumbai, 22lakh families are eligible for “free housing” based on current regulations. With an increasingly high demand for housing in the city, with a low supply due to inefficient policy mechanisms to match it, most people live in precarious conditions of temporary housing in the city. Everyday life in the city is an unending sojourn embedded with crime, inequity and insecurities. In this context the most contested of all issues is that of informal housing. The process leading to DP 2014-34 began with a first step of assessing the existing land use in the city, and verifying any changes over the last 20 year period to update the plan accordingly. When the existing land use (ELU) plans were published in the public domain several civil society and community groups took offense to the ways of representing ‘informality’ on the plan. The DP is a medium to map and plan for growth that is ‘formal’ with clearly visible boundaries, ownership, space and use. There is little space for local specificities, complicated tenancies, or uses that question the categories established in the plan. Hence the pressing question of the hour is, ‘how does one of the only statutory development documents in the city read, represent, and secure the rights of marginalized communities’? The ELU plans represent several forms of traditional living environments like urban villages, fishing village communities, and tribal settlements along with slums and squatter settlements under a single purview of “slums”. These are large portions of the city marked under a “brown” land use, with little attention given to mapping infrastructure provisions such as roads, water supply, electricity, education and health amenities, as done for the rest of the city. The lack of representation on the plan, shrouded by a uniform brown land use has brought several communities to the edge. As a young architect going through undergraduate architectural education in the city, the popular narrative often used to justify a lack of data in the city was, “if you make informality legible, it will be easier to erase”. However, for the first time one has seen community members, marginalized groups come out and demand for representation. The power of being a legible, legitimate entity on the plan is seen as a means to attain a sense of formality in the city. The narrative has thus shifted to, ‘if we are legible, then we will be audible’. November 29th, 2013 was an important day in the city. It was marked by the first open public participation held by the corporation to present, discuss, debate and hear from community members what their aspirations and grievances with the Development Plan process thus far. The plan preparatory studies report that includes valuable data and analysis of the city, and which will be used as a basis for any DCR recommendations, was published in the public domain a week before then. Civil society organizations and community members were present at this meeting voicing their ideas, aspirations and most evidently their fears. At the meeting it was declared that the corporation over the next year will be bringing the Development Plan into effect by going through adequate participatory processes, taking in comments and suggestions and revising the document adequately. Simultaneously, they will continue to work on what they call ‘a second-tier of planning’; that is the DP is seen as a ‘Meso plan’ incorporating long-range planning issues, land use and zoning and strategic projections over the next 20 years and the 2nd tier plan will be in the form of a Local Area Plan (LAP) produced at neighbourhood level. For this the corporation has identified seven areas where typical LAPs will be prepared to demonstrate the level of details and strategies it can get into. Additionally, the Vision document to the DP includes three distinct but related visions—of a competitive city, an inclusive city, and a sustainable city; these visions however benevolent do not seem to carry forward to the level strategies and projections. The document thus reads as argument towards intensification of built-up area to meet various demands, rather than a careful approach towards mapping identified issues comprehensively and thus developing frameworks that are bold, and inclusive in the real sense. Organizations representing marginalized communities have therefore been working arduously right from the initial stages of plan preparation to ensure adequate representation. A lot of work is yet to be done, both by community members and by the corporation. And this is not to say that the efforts of the corporation are in anyway undermined; the Mumbai DP 2013-34 is by far one of the most comprehensive plans developed thus far even at national level. People’s work is only directed towards bringing greater value to the document and to ensure that communities are not left out, yet again. The corporation plans on hosting theme based participation sessions as well as participatory workshops at local sector (ward) levels; and over the next year the city of Mumbai will unravel its fate as the plan opens up to its people. Mumbai’s activists push for the recognition of various types of informal settlements in the city’s development plan, itself a forward looking document. There is hope yet! Such a relevant issue. We need a nuanced understanding of informality in order to address it for our cities. Activism is an essential process to making this happen for our cities. Your post is inspiring. Mumbai is so complicated – it’s amazing that there are people like you working on such relevant issues. Certainly very inspirational. Disenfranchising fishing communities, urban villages, tribal villages etc. that have existed for several decades, if not centuries, in Mumbai, is just sad and I hope the city works to give them a voice and a colour on the map! Addie! Just saw your comment. Thank you! Glad you liked the post. Reblogged this on Terra Urban. This is a great post! Thanks for sharing it. I have some follow up questions, mainly about how all this relates to the Slum Maps from Open Mumbai and the JNNURM and/or RAY. Is there any chance we can discuss this? Thanks. Thanks for your great comments! Apologies for replying with such delay. If it’s not too late and your questions are still unanswered, you can write to me at rangwala.lubaina@gmail.com; I’ll be happy to chat further.